Chardham Yatra – Doorstep to spirituality and eternity, is the most vital religious journey commencing from May and goes on till mid of November in the lap of Himalayas in Uttarakhand, India. It is said that one undertaking a tour to the four pilgrimage centers( Chardham) of Indiathat include Gangotri, Yamunotri, Badrinath and Kedarnath will not only get an opportunity to purify his/her mind and soul but certainly will get released from the cycle of birth and death. From beautiful forests, magnificent shrubs, gushing cascades to deep woods, these holy places have loads of sights of mother’s nature. In order to make this spiritual journey more imposing and gratifying, guests can accommodate themselves at one of the best hotels in Chardham circuit. All the hotels nestled on the route to Chardham from Haridwar proffer world class amenities and a great amount of enjoyment. So, if you are pondering a celestial Chardham Yatra, it is essential you should book the room in advance to savor the hassle free trip. Here are some of the top hotels that render guests a comfortable stay with mind-blowing experiences that they will love to cherish eternally. Hotel Landmark is amongst the best hotels in Haridwar proffering swish facilities and warm hospitality to its esteemed visitors. It is easily reachable to the famous spots including Moti Bazaar, Daksh Mahadev Temple and Har-Ki-Puri. The hotel has 21 well furnished rooms, which are divided as deluxe and standard rooms. Moreover, the staff ensures that you have the best time of your life as long as you stay here. Nestled on the bank of river Ganges in the heart of Haridwar, Khanna Palace offers a perfect accommodation in a splendid location, miles away from the noise of the city life. It boasts of 41 rooms, which are superbly designed keeping in mind the desires and necessities of the guests. Some of the in-room facilities are satellite color TV, mineral water, tea/coffee maker, round the clock room service and attached washroom. Cushioned with gorgeous visions of river Yamuna and nature’s beauty, Hotel Samrat brings engaging hospitality united with 18 double bedrooms that are nicely endowed. The hotel’s restaurant doles out varied varieties of cuisines including Indian, Chinese and Continental foods to excite the taste buds of the visitors. Enclosed by lush greenery all around, Hotel Chauhan Annexe renders you an opportunity of experiencing the ultimate comfort in its well-furnished rooms. It is an idyllic destination for those seeking a deluxe accommodation in Barkot, Uttarkashi. All the rooms proffer splendid vistas of natural scenery. Experience a pleasant and splendid stay in perfect setting at Divine Palace, which is among the famous properties of Uttarkashi. The nearest railway station is Haridwar, which is 110 miles away, while the bus stop is situated at a distance of 3 miles from the palace. It renders its guests an accommodation in homely essence. Located enroute Gangotri in Uttarkashi with the quaint beauty of the surroundings, Shivlinga Resort is indeed a wonderful destination to unwind with friends or families. The resort proffers invigorating therapies for the nomads like Ayurvedic massage, spa and yoga classes that will not only help you in taking off the strain, but keep you fresh and relaxed round the day. Besides, Shivlinga’s gracious accommodation renders a wholesome staying experience to its guests. Situated enroute Kedarnath with sparkling views of perfect surroundings, Mrityunjay Palace is the most admired property among the Indian as well foreign travelers. It provides a calm and pleasing stay to the travelers by bringing a wide range of swish amenities and services. With its 10 spacious rooms to choose from, the hotel offers essential as well as modern amenities so that one doesn’t fall short of anything during the holidays. With the setting of magnificent hills, Hotel Shubham is the perfect option for your stay in Guptakashi. The hotel has a good collection of staff members that make sure that the guests savor their stay to the hilt and their expectations are met. Having well designed rooms along with necessary amenities, it is an ideal stoppage for those seeking a complete rest in the heavenly environment. Offering a chance to stay close to nature, Punjab Sindh Awas’ location is simply beautiful with splendid backdrop and pleasant ambience. It proffers all the essential facilities and comforts that one could imagine. Double bed and four bed room facility are available here. You can select the one that suits you the most. A perfect amalgamation of great comfort, world class facilities and friendly hospitality, Himachal House is set in the beautiful sacred town of Kedarnath, Uttarakhand. It renders spacious and neat rooms with copious amenities to make the stay of the guests memorable and unforgettable. In addition to this, Himachal House’s restaurant serves vegetarian delicacies to satisfy the craving of the visitors. 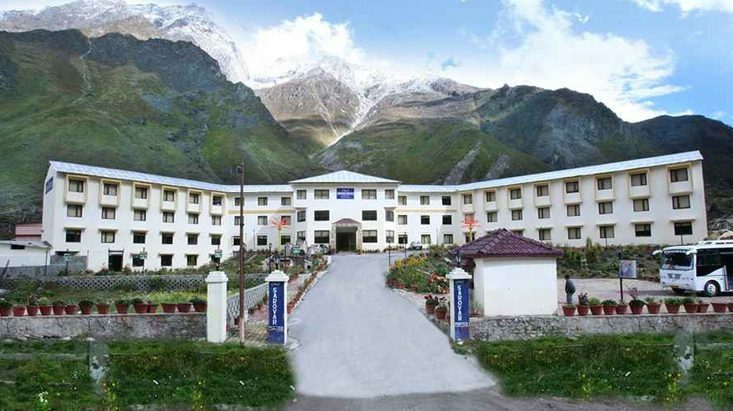 With close propinquity to the famous spots of Uttarakhand such as Valley of flowers, Badrinath, Chopta and Hemkund Sahib, Hotel Badrinath is one of the most excellent hotels situated in Pipalkoti. It has 26 well-appointed rooms that not only provide you comfort but superb facilities for making your holidays worthy and gratifying. Hotel Shivlok is one of the most celebrated properties of all hotels in Pipalkoti. It offers you a stay in an ambience of harmony and tranquility. Moreover, the hotel brings oodles of plush facilities and services for mind-blowing experiences. It has a sum of 40 rooms, which are divided into deluxe, super deluxe and suite. Each of them comes with great amenities that include telephone, room service, intercom, power backup and attached washroom. Step into the world of undying magic and hospitality that can make anyone spellbound and fascinated at Shree Shankar situated in one of the most famous religious centres of India – Badrinath. It provides a good accommodation with top class facilities that will undeniably take the strain off your mind and grant a pleasant sleep which is worth than anything else in the world. Dwarikesh welcomes travelers from all across the globe to a destination that tender you a view of the Neelkanth from the balconies of rooms besides warm hospitality filled with celestial traditions and service. It has a total of 32 well furnished rooms that are endowed with bountiful facilities like round the clock room service, intercom, TV and attached washroom. Positioned on the Badrinath road in the splendid town of Rudraprayag, Hotel Sheetal offers its visitors an ideal stay among the emerald beauty. It is fabricated beautifully keeping in mind the taste of the visitors. Whether you are seeking for exhilaration, comfort or adventure, one could find all at Hotel Sheetal. The rooms in here are magnificently decorated to magnetize the attention of the guests at the first look. Balbir Palace bestows the mind-blowing experience that you deserve to be had and assures you that your stay will be most remarkable of life. It is situated about 2 miles from Rudraprayag, 5 miles from Koteshwar temple and a few miles away from Auli, Hemkund Sahib, Valley of Flowers and Kedarnath Dham. Come to a destination where the gentle breeze touches one’s heart, silence seems delightful and captivating vistas of Garhwal Himalayas can make anyone stunned for a while at Monal Resort. It has 52 well designed rooms encompassing standard rooms, deluxe rooms, premium rooms and suites. Each room is provided with balcony, which offers a sight of the Alaknanda River. Encircled by hills on three sides, Hotel Rishabh is the best place to let everything go and enjoy the superb attractions of Rishikesh, which are situated hardly any distance away. It offers endearing hospitality and impeccable service to enliven tourists who arrive from all across the globe. It has a sum of 18 rooms, which gives out an environment of complete serenity and harmony. Tapovan resort is lying amidst the rich natural exquisiteness in the adventurous yet spiritual city of Rishikesh, Uttarakhand. The resort is worth the cost charged as it is well maintained, neat and hygienic. Proffering 28 air conditioned rooms, each of which comes along with abundant facilities to make the visitors stay pleasant and comfortable.